Fish is a nutritious food that can be served to young and old alike. However finding recipes that appeal to all the family can be hard. This fish pie recipe should do just that and has the added advantage of being able to be changed to suit individual family members. This pie can use a variety of fish. Take a look in your supermarket or fishmongers for off cuts of fish and special offers. 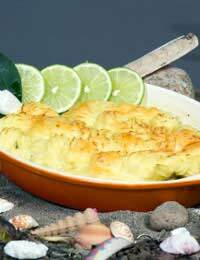 Try to add some smoked fish such as haddock or cod to the recipe as it brings extra flavour to the dish. Also a few prawns or even crab sticks give interest and flavour. The potatoes are mashed in this recipe so need to be old potatoes as opposed the small new potatoes. Maris Pipers always make lovely mash but if you have problems try the frozen mashed potato – some top television cooks swear by it. If you find that your potato when mashed (or defrosted) is too sloppy add a few tablespoons of dried mashed potato mix to firm it up. Try keeping a packet of this mix in your store cupboard as it is handy for thickening soups and stews. Many sauces in fish pies have cheese added. Remember that if you have strong smoked fish in your recipe the cheese flavour will be fight the fish flavour. If your fish flavours are mild add more cheese to the dish but keep to a mild cheese is using smoked fish. It surprises many people to find egg in their fish pie but traditionally it has always been an ingredient of this recipe. The hard boiled eggs can either be sliced and placed between the fish sauce and the potato layer or halved or quartered and mixed in with the fish sauce. This fish pie recipe can be made from leftovers in your freezer. Pieces of fish, prawns and crabsticks left over from larger packets can be used alongside leftover mashed potato and piece of cheese in the fridge. Even vegetables and tomatoes can be added for extra colour. Take this recipe and change it to suit your family’s likes and dislikes and what you have in your cupboard! Cut the potatoes into even sized pieces and place in a pan of salted boiling water and simmer until the potatoes are cooked. Drain and mash the potatoes with half of the butter. Meanwhile place the fish, onion, carrots, celery, bay leaf and milk into a pan simmer gently until the fish is cooked. Drain and keep the milk. Flake the fish pieces and place along with the vegetables into an oven proof dish along with the prawns, crabsticks and peas. Place the milk back onto the hob to simmer. Take half of the remaining butter and mix with the flour to form small balls. Add the balls gradually to the milk until it forms a thick sauce. Add three quarters of the cheese and pour over the fish and vegetable mix. Slice the hard boiled eggs and layer on top of the fish sauce mix. Carefully spoon the mashed potato over to top and make sure it spreads to the edge of the dish to provide a seal. Scatter the remaining cheese over the top and place on a baking tray in the middle of the preheated oven for thirty minutes or until the top is golden and bubbling.